Learn to putt . . . perfectly ‘How to never miss a 4ft putt . . . ever. The perfect putting method’ GQ Magazine. Learn how to master the Trevillion Pencil Grip – the foolproof method that has been adopted by the professionals themselves: Fleetwood, Rose, Garcia, Francesco Molinari and Branden Grace are just a few . . . Championships are won and lost on the putting green, and one of the most repeated phrases after a disappointing round of golf is ‘If only I’d holed my putts’. But there is a simple way to dramatically improve your ‘pressure putt’ performance: The Trevillion Pencil Grip. Renowned sports artist Paul Trevillion is the inventor of the uniquely effective split-hand technique. He describes the pencil grip, which he spent four decades refining, as the ‘art’ of putting: you aim at the hole and draw a straight line. As he explains: ‘Too often on TV you hear, “he pushed the putt”… but an artist never pushes a pencil.’ In The Art of Putting, Paul Trevillion discusses the evolution of putting methods and reveals the secret of his technique with honesty and humour. 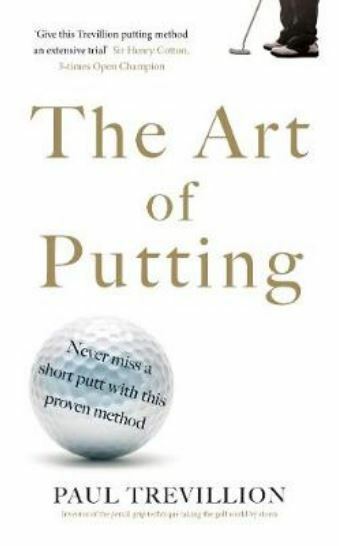 Instructive, entertaining, practical, unique and effective, this book is one of the soundest investments any golfer can make to ensure that they never miss a four-foot putt. ‘I am so confident in my putter and method that I challenged the top 50 golfers in the world to a $1000,000.00 putting challenge’ Paul Trevillion ‘Very few titles are won by golfers who putt badly, no matter how supreme a player’s ball striking is, such prowess will always be undone by a missed three-footer . . . putting is an art rather than a science’ BBC SPORT.